With many years at sea on sailing yachts ( Felicta West and Athena ) professionally since 1991 , learning the skills required for the demanding superyacht industry. 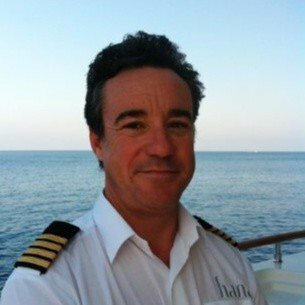 Trials Captain for Palmer Johnson Yachts (UK) for the first 170 series , and operational Captain for Feadship( Motor Yacht GO ) and project manger for Turquoise Yachts ( Motor Yacht HANA ). Also as Charter Captain – with many successful charters completed in Med , Caribbean and Tahiti. Specialties: Command, Communication, Security, Project Management for new builds as owners rep .